extraordinary energy levels. Energy combined with a thinking mind behind a strong is a formidable talent in itself. This is so with Laxmi Mittal. Check out his hand photo here. Three aspects of Mittal's character stand out. First, his high energy level. The large palm with strong lines and mounts and short fingers and good middle phalanges of the fingers bears it out. The balance of personality is the second factor. This too is a quality much underestimated when it comes to evaluating business and/or managerial success. Most of us are slightly off balance, which affects our ability to deal with the real world. Those of us who are well balanced can achieve much, even with ordinary abilities. Bill Gates is another example of someone who possesses this quality, although Gates is an entirely different kind of person as compared to Mittal. Laxmi Mittal's shows a good balance of the thumb phalanges, mostly straight fingers with a long finger of Mercury (little finger). The mounts are not excessively developed, and he has a good mount of Venus and that of Upper Mars. The Head and Heart Lines are in tandem with each other, and his Jupiter (index) and Apollo (ring) fingers are long. All this shows not just shows ambition and a grasp of worldly affairs, it shows a good balance between a strong will, reasoning powers and warmth of personality. It also shows a fairly straight-talking person with firm control over the emotions. The fingers show an action-oriented, decisive nature, but these qualities are tempered by reasoning, and thoughtfulness (thumb, knots, Head Line) and his hand also shows resistance and nature which is not easily discouraged. The third important aspect of Mittal's personality is his desire for excellence. The first phalanges may not be long, but they are slim and well shaped. This adds strength to his other characteristics. It shows a person with a strong motivation to succeed along with a quest for excellence. His ambition and desire to excel are in balance. Greed will not dictate to him the future course of action. The last but not the least important factor is the business acumen. He understands money, and that is an understatement. Mittal also possesses shrewdness without cunning, an unusual quality. For a person of his type, it is normal to expect well-developed Mounts of Jupiter, Mercury and Apollo as they add to the strength of the fingers and the qualities of the Mounts. The strong Moon is a great asset to an entrepreneur with a strong mind. This adds to his personality is the quality of imagination and creativity, which is being directed towards entrepreneurship. From whatever is visible of Laxmi Mittal's Life Line it seems that he needs to watch out that he doesn’t burn itself out in the coming years. If he came to me for consultation I would tell him to take a few weeks off every year, starting from today. I think what makes you good at this is that you understand people. Thanks for a good read. As you pointed out Nita, many successful business persons have a great deal of energy. I guess it boils down to how they channelize it. There are many examples of people with talent and courage channelizing all their energies in the wrong direction. If he is the fifth wealthiest person, that tells us a lot! Another interesting point you made was that of using imagination and creativity in business - very few people do that!! Yep, channelising is everything. That is what type of person you are matters. I guess Mittal grew up with the virtues of hard work impressed upon him. And about the creativity aspect, I guess thats what makes an entrepreneur different from a manager. Okay DI, I'll do it in the comments section. A commentator on this post posted a rude comment asking me to post Laxmi Mittal's hand photo on this post even though the link to the photo is clearly mentioned here. I guess he either did not read the post or is too lazy too click on the link. Just in case he comes here again, I want to assure this person that I do not have a personally taken photo of Laxmi Mittal with me and I do not post copyrighted photographs on this blog. I know that being ethical is not rated highly these days but sorry, I do not break this code even though I know I will not be prosecuted if I post a copyrighted photo. Very good articles on Laxmi Mittal's palm reading . Give some more insight to other celebrities as well. This is treasure house of celebrity hand reading. 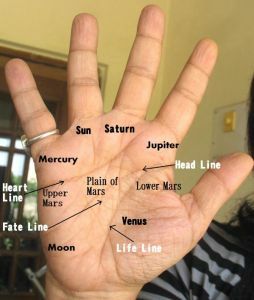 Amazing inputs on palm reading. Keep it up!